Every year, we dedicate part of our resources to the development of open source Assistive projects, involving 3D printing and modelling, aimed to help people with disabilities. On this page, you can see the projects we already published. We released a free useful tool for visually impaired people: an incredibly simple text to 3D Printable Braille converter. Launch the software and enter the text you want to convert in Braille. 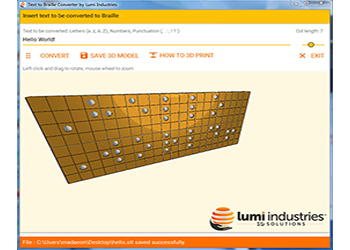 The program will translate your text into Braille language creating the 3D model of a solid label as a .STL file that you can 3D print with our Lumipocket LT 3D Printer, or any other resin-based or SLS 3D Printer. Lumipocket LT is the first portable, user-friendly and affordable resin based Multi-function 3D printer. It is the perfect solution to print small details like Braille language dots and easily create labels to help blind people to perceive reality around them. This text to Braille converter and Braille label creator software is a great educational support for parents, teachers, educators of visually impaired kids and adults. MOLBED is a side project developed by Lumi Industries’ founder Davide Marin. It is part of LUMI INDUSTRIES CARES initiative in line with our philosophy to show how 3D printing can really benefit everyone! MOLBED is dedicated to visually impaired people and aim to give an alternative to expensive refreshable Braille displays currently available in the market. We have created a single character module with 6 small pins, 3D printed with our LumiForge resin based 3D printer and a magnetic retaining system. Their are mounted on an electronic board which controls their movement. The final goal is to build an entire Braille refreshable screen as a standalone device like a Braille Tablet, or incorporated into an existing device. The project was self-funded, and we decided to not patent this system because we’d like to see as many people as possible benefit from it. This project has been selected as one of the thirteen finalists of MakeToCare Prize 2016, promoted by Maker Faire Rome and pharmaceutical company Sanofi.